The average temperature for most tropical regions is about 35° C. This and the accompanying high humidity spells doom for power plants in such regions unless something is done to counter the effects. Large scale power-generation relies on gas turbines, which have limitations at higher temperatures. For maximum power plant power output and efficiency, inlet air temperature should be 15° C or even lower. Unfortunately, this is not normally attainable in humid and hot conditions unless refrigeration systems are used. The use of Turbine Inlet Air Cooling to augment turbine power is now a popular technology worldwide and ARANER is a renowned provider of this solution. The company has footprints in the Middle East and other regions. Have you ever wondered how efficiency is determined and the steps taken in case one wishes to achieve higher values? There are several ways of determining power plant efficiency. A popular one is heat rate (amount of energy a power plant uses to produce 1kWh of power). Heat rate can be expressed as kJ/kW·h. However, borrowing from the U.S. Energy Information Administration (EIA), heat rate can be expressed also as British thermal units (Btu)/kWh of net power generated. It is also possible to express efficiency of a power plant as a percentage. It is important to note that this is just one of the numerous ways of expressing energy and efficiency in power plants. The concept is usually the same-comparing what is consumed by the facility with what is sent to the grid. Net power generation refers to the power sent to the transmission line from the power plant. In other words, it is the power realized after catering for all power plant consumptions including cooling facilities, pollution control equipment and fuel feeding systems. Interested in increasing these parameters? The gap between power availability and power demand is increasing in many places, leaving power stakeholders with limited options. One of the most feasible solutions is to boost the power output and efficiency of existing power plants. The other option —though more expensive— is to build new power plants and incorporating modern power augmentation methods. For arid areas, the options become even trickier owing to water scarcity. Plant owners and managers mostly choose between wetted technologies and turbine inlet air cooling with chilling; depending on water availability and desired power output. ARANER’s clients in hot humid areas are installing TIAC with chiller systems in their numbers. This is despite the fact that TIAC with chillers tends to be costly up-front than wetted technologies. They have learnt that the long term benefits of this technology over the facility’s life cycle are more important. Chilling TIAC is a refrigeration-based technology that can use either absorption chillers or mechanical chillers to produce chilled brine or water that goes to a special component for heat transfer. Air passes through the heat transfer device for cooling before going to the turbine. This increases air mass flow rate, subsequently enhancing power plant output and efficiency. By its nature, this technology provides several advantages for power plant managers and owners as enumerated below. If you have decided to use this cooling technology, the first thing you will enjoy is predictability of power plant output. TIAC systems come with control technology that introduces operational stability in the system. Still on this point, TIAC can also include thermal energy storage (TES) if there are times of less power demand. The target of this approach is to maximize the extra power during peak power demand times. Moreover, a TES tank helps reduce cooling plant size and operational cost. TIAC is the ideal power augmentation solution in arid areas because it can rely on a closed water cycle with the possibility of zero water consumption. Middle East and other areas affected by water scarcity find this technology as the sole solution for efficient power production. Life cycle cost of a power plant covers procurement, construction, maintenance, operation etc. TIAC has been used to regain the productivity of many gas turbine power plants, thereby containing life cycle costs. While building or rebuilding a power plant, it is essential to strike a fine balance between the life of the facility and initial cost. It is a known secret that some companies choose the path of lower initial investment to the detriment of longer-term performance of plant. 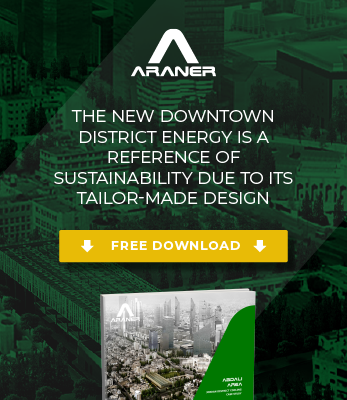 Partnering with an experienced provider such as ARANER for power plant construction and management may probably mean high initial investment when compared with wetted technologies like fogging or evaporative coolers, but this will even out in the long term. Power plants in hot and humid climates can only save fuel and produce more power by increasing thermal efficiency. The simplest approach for more increasing power plant output and efficiency is to cool the turbine inlet air. That explains why TIAC and TES have received so much attention in recent years. Yes, fogging and other older efficiency improvement methods may be used, but they may not be as cost effective as the reviewed technologies, at least in the Middle East, North Africa, California and similarly hot regions. Contact ARANER for more about these indicators and improvements for better plant performance.